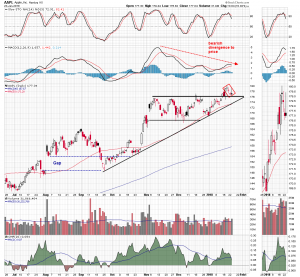 A rarely seen “tri-star”candle pattern formed on the daily Apple (AAPL) chart on Monday. 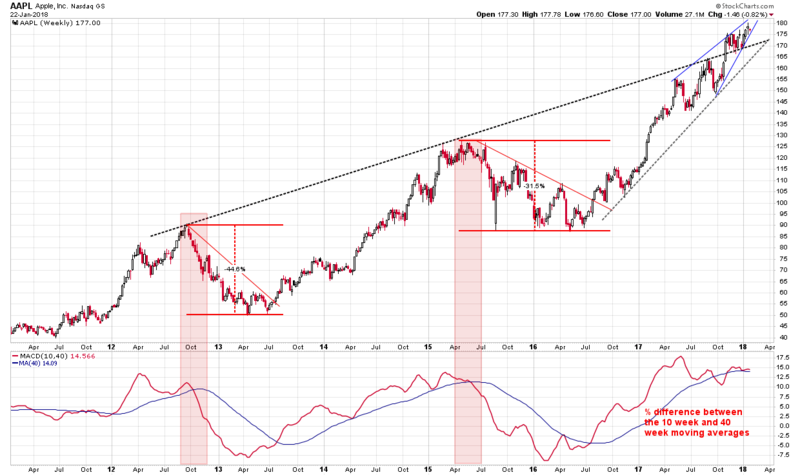 It may suggest a reversal in the upward trajectory of the stock and a potentially deep pullback in price. Recently, Apple shares have seen a short-term disconnect with other stocks in the technology sector, and this infrequent tri-star candle pattern, coupled with a deeply over-bought condition, could be signalling the start of the pullback. A look at the weekly chart puts the daily price action in context. It shows the six year Apple rally has been punctuated with two deep percentage corrections. These have occurred when the 10 week moving average has diverged sharply from the 40 week moving average. The graph at the bottom of the chart shows the relationship between the two averages and is overlaid with a 40 week moving “signal” average. Crossovers have signaled changes in the intermediate term direction of price. 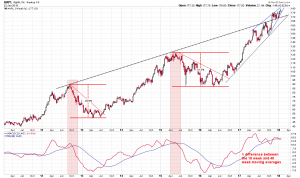 The average line is currently making a lower high in negative divergence to the rising stock price, and looks like it is preparing for another bearish crossover below the signal line. The overbought condition reflected in the divergence between the moving averages is punctuated by the price action over the last nine months. During this time, a nearly vertical triangle has pierced a long term resistance line drawn off the highs of the charted period. Price has reached the apex on the triangle pattern, a move looks imminent. On the daily timeframe, the recent break above a short-term horizontal resistance line was quickly followed by a series of three doji candles. A doji is a candle with a narrow opening and closing “real” range, and reflects investor indecision. When three consecutive dojis are formed the sequence is called a “tri-star” pattern. The tri-star is a rarely seen reversal pattern. A perfect bearish tri-star consists of a second doji that is higher than the first and a third that is lower than the second. In this case, each star is lower than the previous one, but this is still an infrequent occurrence and the indecisiveness of the rudimentary pattern is equally as clear. Daily moving average convergence/divergence is in bearish divergence to price and the stochastic oscillator is making a negative crossover in its overbought range. Price action and several technical indications on multiple timeframes suggest a pullback is underway which has the potential to be deep. But this pullback, if it does occur, is not likely to be as great a percentage move as the previous two highlighted,because of countervening fundamental and technical conditions, but traders should be alert to the possibility. A gravestone doji formed on the daily chart on Tuesday. This doji is characterized by a narrow opening and closing range “real” body situated near the bottom of the overall range. It’s high wick suggests that buying at higher levels was met with selling pressure and is considered a bearish reversal candle. This is the fourth doji candle in a row on this chart.